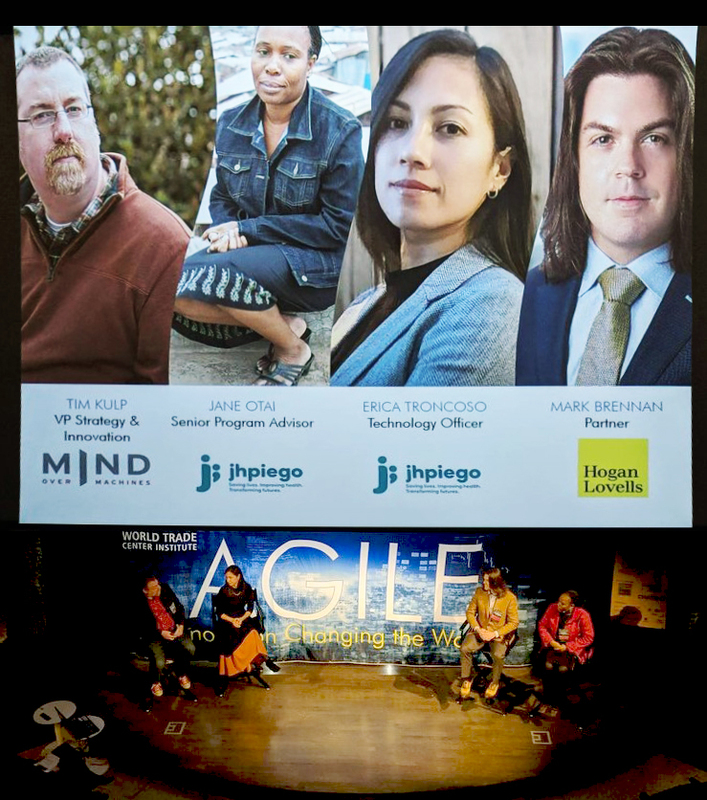 When our Director of Strategic Partnerships Mike Rolfes attended a session last year, he knew AGILE needed to tackle artificial intelligence. He connected WTCI’s Chief Innovation Officer Susan Aplin with our VP of Innovation & Strategy Tim Kulp, and the rest, as they say, is history. WTCI had a good feeling about 2019’s first session, The Key to Growth: Innovations in Artificial Intelligence, but the topic proved to be even more of a draw than expected. They had so many reservations they needed to move the TED Talk-style event from Baltimore’s National Aquarium to the Parkway Theatre. As the first speaker of the evening, Tim provided an overview of AI, what it is and what it can do. But first, he had to address the elephant in the room. Fear of obsolescence makes many people (even progress-minded C-levels) put up barriers to understanding the technology. We need to change our thinking about AI and see it as something that augments, rather than replaces, us. If we are able to embrace new ways of working, machines can enhance our creativity, help us be more human. Reason: With training, machines can learn from, and form conclusions about, imperfect data. Bellevue, WA, is using machine learning and simulations to identify dangerous traffic intersections and find ways to make them safer. Understand: Via computer vision, speech and image recognition, machines can interpret meaning. For example, warehouse cameras can track equipment and alert workers to problems without a human continuously monitoring the video feed. Interact: Machines can interact with people in natural ways. The business world sees this routinely now with chatbots and digital assistants, but computers can actually help people interact too. Equadex’s Helpicto enables nonverbal people to communicate by translating images into spoken words. Thinking drives behavior; status quo thinking gets us stuck in a rut. For better or worse, technology has fundamentally changed our world. We’re used to getting instant answers to all our questions, immediate responses to all our needs. (Just ask Alexa.) Has your company changed with the times? Tim invited attendees to rethink their businesses with a simple exercise: The slate is clean. You are starting your business from scratch today. As you design your processes and structure your team, how will you leverage AI’s capabilities? When you unshackle your mind from ‘the way we’ve always done it,’ countless new possibilities arise. But that makes strategy and ethics even more important than ever before. AI changes the fundamental business question from “Can we?” to “Should we?” Tim uses Facebook as an example. Facebook’s mission is to connect friends and family, but its business model is bombarding users with ads; the two don’t align. Once you’ve determined what your company should do, the challenge becomes doing it ethically. AI practitioners must proactively look for and address bias in the data machines are using to reason, understand and interact. The following three presenters of the night shared their experience and expertise dealing with data bias and the ethical considerations of AI. First, Jane Otai and Erica Troncoso of Johns Hopkins-affiliated international nonprofit Jhpiego explained how they are using AI to improve women’s health services in developing countries. They are working to better serve invisible or hidden populations, those who are traditionally unrepresented or underrepresented by the data. Finally, Logan Hovells’ Mark Brennan spoke to the legal and ethical challenges of AI and how policymakers are attempting to regulate the burgeoning technology. WTCI provided Technical.ly with a full event recap. The audience was engaged and inquisitive throughout, providing lots of good interaction with the panelists, but the evening ended on a cautionary note. A final questioner asked whether we are adequately preparing our workforce for an AI-fueled future. Every panelist responded with a resounding, “No!” Not only are we not preparing workers, we are woefully underpreparing them for the Fourth Industrial Revolution. Luckily, Mind Over Machines has plenty to say about the types of jobs on the horizon and how people can develop their strengths to stay engaged in a rapidly evolving economy. In the months ahead, Tim Kulp will be digging deeper into workforce development and where we need to go from here.